The origin of churros is a little bit contested – as these things often tend to be. Some credit the Spanish for the yummy fried choux pastry fingers. Others credit the Portuguese. Either way, they made their way over to Latin America during the time of the conquistadors where today they’re pretty much a breakfast staple dipped into chocolate sauce. 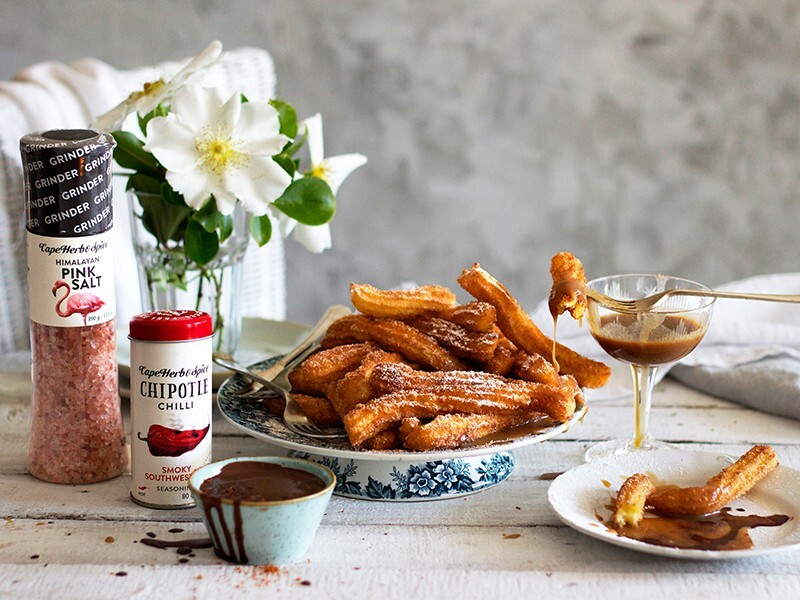 Not a bad way to start the day to be sure, but we think churros are a dinner party winner (in a big way!). People can’t get enough of them and they look like you went to loads of trouble – while actually you didn’t. That’s the way clever peeps entertain – minimum effort, maximum impact. To impress even more, serve your churros with not one dipping sauce but two! Heat the cream until it’s just under boiling point. Pour the cream over the chocolate and stir until it is completely melted. Stir in the vanilla and a pinch or two of your favourite Cape Herb & Spice Chilli Seasoning. Cover and allow to cool to room temperature. It will thicken as it cools down. Add all the ingredients to a saucepan except the salt. Slowly heat it whilst stirring. Once it comes to the boil, turn the temperature right down and boil for 5 minutes, stirring occasionally. Give it a few grinds of Cape Herb & Spice Pink Himalayan Salt, cover and allow to cool. Bring the water and butter to a vigorous boil in a large saucepan. Remove from the heat and stir in the flour and salt. Keep on stirring it until the dough forms a ball. Now break in the eggs one by one, stirring the dough vigorously until each egg is incorporated before you add the next. It will initially seem like its splitting and will never come together – rest assured, it does. Spoon the dough into a piping bag fitted with a star nozzle. To fry the churros, pipe 5-7cm long strips of dough into hot oil at least 5cm deep. Fry until golden and crisp. Drain on kitchen towel and toss in cinnamon sugar while warm. Serve right away with the dipping sauces.